I'm excited to jump out of bed every morning because the projects I'm working on are passion projects. I genuinely enjoy the work that I'm doing, and each day is a new adventure. I wake up excited to see what the day will hold. How do you define inspiration? To me inspiration is anything that pushes you closer to self-actualization. We're all striving to become the best version of ourselves. Inspiration is anything that motivates us towards that. What is an accomplishment you're most proud of and why? There are a few things that I could consider as my proudest accomplishment. However, to date, the thing that I'm proudest of is taking the leap of faith to leave my corporate job to pursue my dream lifestyle. I'm proud of this because I had to overcome the warnings from family and friends, fear of not being able to make my MBA student loan payments, and fear of failure. How did you end up as an American Expat in Bali? I've always had it on my heart to live abroad for an extended period of time (i.e. longer than my 5 month stint in Paris). I visited Bali in March 2017 and immediately fell in love. On that trip I visited Cambodia, Thailand, and went on to visit Bali at the end. Southeast Asia as a region was amazing, but Bali was special. The people, natural beauty, and culture snuck into my heart. By day 3 I knew I had to move back. How has Bali impacted your quality of living? In Bali I have a private pool, staff, and access to endless inexpensive clean organic food. I'm able to cheaply travel the region and experience new countries. As an entrepreneur it would be very difficult for me to replicate this lifestyle in the U.S. I'd definitely say it's a vast improvement from what I'd be able to afford or have access to otherwise. If you could give advice to your younger self, what would it be and why? I don't know that I would have taken a different path to get to where I am now because I believe that all of the pieces fell into place in the right way at the right time. However, one bit of advice I'd give to anyone is start paying attention to your passions. What excites you? What could you talk about or do all day? Those are the things you should lean in on. Who is your role model and how do they inspire you? My older sister is my biggest role model. She's a psychologist and has a very successful mental health therapy business. I've watched her grow her business and receive many awards for the work she does for the black community over the last five years. She's my inspiration. Any key tips to share with other black travelers looking to relocate overseas? Research if that country has a black community - Medellin, Colombia has a large black community. Set Up A Budget - Expat Insurance, Housing, Food, Transportation (see if you can use ride sharing apps). Mentally prepare your friends and family for the big move. Research the perception of black people in the country you're looking to relocate to. Research the type of terrorism within the country (if any). Entrepreneurs translates well into living overseas. See If you’re excited about the surrounding countries within the region of the country you're looking to move to. Give yourself 12 months to save before relocating overseas (especially if you’re an entrepreneur). Set a budget around the cost of living of the country you’re relocating to. If you could share with the world something interesting about yourself, what would it be? I'm a social introvert. Most people think that I'm a super extrovert because I'm often out meeting new people and socializing. However, I recharge when I'm by myself in my own thoughts plotting and executing on my dreams. Name three countries you've traveled to that absolutely captured your heart and why? Luanda, Angola - I traveled to Angola for work for a month. I was originally scheduled to go to Brazil, but there were visa issues that led the company to send a Brazilian counterpart instead. When I found out I'd be going to Angola, I initially thought "they may speak Portuguese but this will not be Brazil". When we arrived I was taken in by the beauty and warmth of the people, the delicious seafood and the vibrant nightclubs that open onto the beach. Portugal - I went to Portugal as a planned trip during my study abroad in Paris. There were three people in my group which included my host and another student. During Day 1 of the trip I somehow got separated from my group. Before long, my phone died and the whole day became a wonderful journey. I walked down cobblestone streets, met a number of friendly locals that took me around to hidden gems, ate wonderful food, and discovered my all time favorite perfume in a small boutique. This one day was what I consider to be my first solo travel experience. It was magical. My biggest fear is not living up to my perception of my own potential. When I encounter something that evokes fear, I usually think about the worst thing that can happen. Then I think of the probability that the worst would happen to me. I'm a rational person, so this process usually helps me realize that fear doesn't make sense. In what ways has travel positively impacted your life? My first experience abroad was to Nigeria for my grandfather's funeral. Seeing that there was a whole different world where people who are related to me by blood are living very different lives really changed my perspective. Traveling has always been a source of therapy and escape for me. It keeps my perspective balanced to see how people around the world are living differently and have different concerns. For example, I did a study abroad in France during my junior year of college. French people really appreciate and value their time with their families and friends outside of work. They relish every moment, working to live, not the other way around. This way of life drastically changed my perception of the Wall Street career path I'd been pursuing throughout school (3 internships on Wall Street). When I returned from Paris, I made the decision to pursue corporate finance instead of investment banking which would have been a more consuming lifestyle. What does the phrase "Keep Shining" mean to you? Keep doing what makes you happy and being authentic in everything you do. Be so happy in your life that other people become happier just from encountering your energy. I am unapologetically authentic because...? I'm genuinely living my best life and pursuing my wildest dreams one by one. Deirdre is a proud alumna of Florida A&M University and The Booth School of Business where she gained her MBA. She has extensive corporate experience having worked at Chevron Corporation and The Boston Consulting Group, but she left it all behind to follow her dreams and combine her passions of travel and entrepreneurship. Though she has traveled to more than 40 countries, her desire to see more of the world continues to grow. 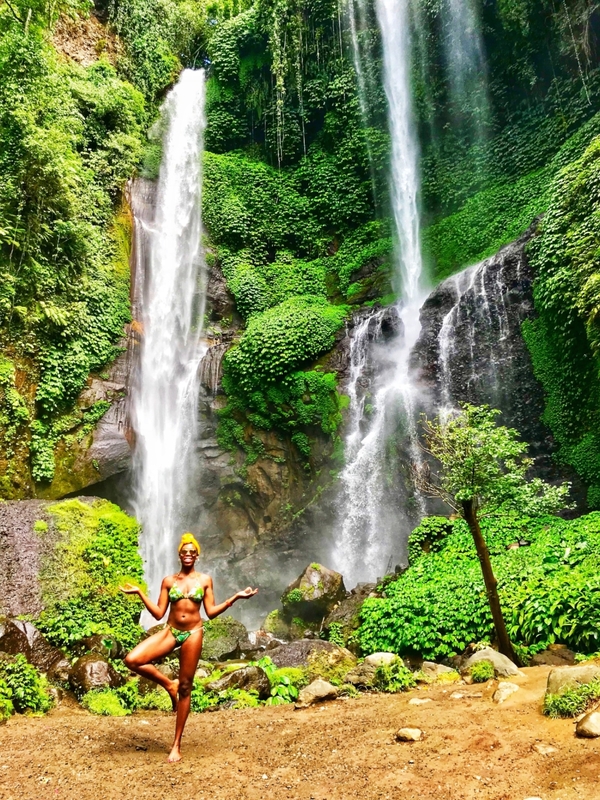 Today, she spends most of her year in Bali, Indonesia where she's able to contribute to the growing entrepreneurial community while also extensively traveling the region. By sharing her journey, she hopes to inspire others to take that leap of faith to pursue their wildest dreams. Want to connect with Deirdre? Follow her @deirdredares on Instagram!